Regular readers of this blog will know that I am a big fan of echiums. I love their jewel-coloured flowers, the way they attract bees to the garden and their incredible range of stature; from sprawling Echium tuberculatum to sky rocketing Echium pininana. Slowly but surely I am increasing my collection in our coastal garden, adding E. gentianoides, E. wildpretii and E. candicans this year. One species, our native viper’s bugloss (Echium vulgare) is missing from the line-up. The reason? There’s more than enough of it already on the shores of East Kent and I doubt very much that I could grow it better than it grows itself. Viper’s bugloss shares many attributes with its Mediterranean cousins and may indeed have originated in North Africa. 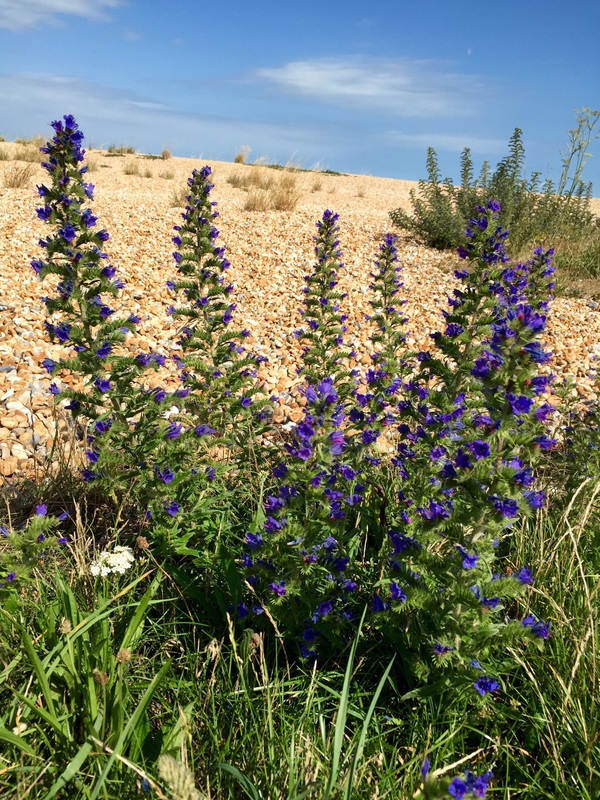 The plants form a rosette of coarse, bluish-green leaves which give rise to hairy spikes of gentian-blue, funnel-shaped flowers from May to September. 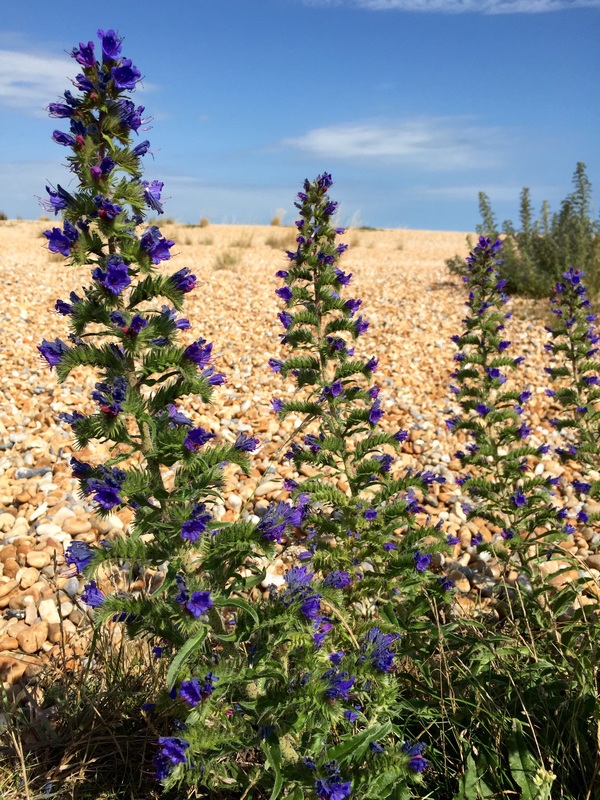 Viper’s bugloss favours disturbed chalk grassland and shingle beaches, rubbing shoulders with fennel, red valerian and mallow. 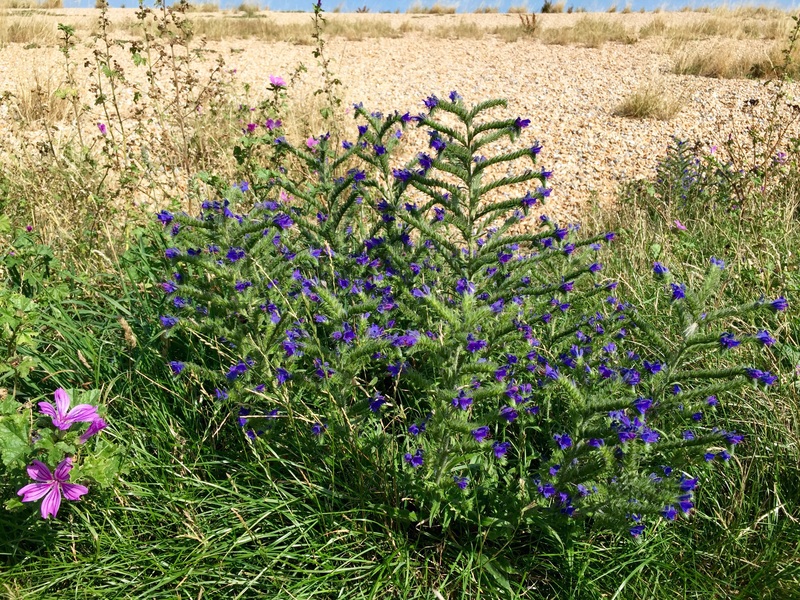 The shoreline between Sandwich and Kingsdown in Kent is festooned with this handsome plant right now, its intense flowers alive with insects including buff-tailed and red-tailed bumblebees, large skipper and painted lady butterflies, burnet moths, honey bees and red mason bees. Honey made by bees that have feasted on echium pollen, which is violet-blue, is said to taste delicious. Historically, viper’s bugloss was believed to cure snake bites and to protect people from being bitten by reptiles. This could well be because the open, parched, wild habitats the plant enjoys are the same as those frequented by snakes. A biennial, viper’s bugloss is perfectly easy to cultivate from seed (some might say a little too easy) provided you can offer it chalky soil and sharp drainage. Personally I think the lapis-lazuli flowers look best emerging from a sun-drenched shingle strand, set against an azure summer sky. A litte touch of The Med on our cold, windswept shores. One of my favourites too I just wish I could grow the towering spikes that I see at my fathers Cornwall garden! I grow phacelia. Not sure if they are related as I have clay-like soil, though it is neutral, if not slightly alkaline. My first reaction when I saw the photo of the beach was to wonder if you had been visiting the desert! I’ve never seen these flowers before. I guess even though I grew up by the sea, the North East is hardly ideal for these plants. Wish I could have them in my garden, though, considering they have such a long flowering season. Any suggestions for such that would grow in partial shade on I’m not sure what soil (front garden is basically builders rubble with a touch of substandard soil over the top)? As far as Echiums go this one is fairly tough. It is native and has been widely introduced, even as far north as Aberdeen and beyond. All it needs is very good drainage and is an absolute must if you have a coastal garden. I wish I was a botanical expert, to be here discussing even the smallest detail with you! What a splendid indigo it is, and the plant sounds very interesting…do the flowers have any scent? Sadly not. I guess a plant can’t have it all? I have echium in my garden and the bees and honey bees love it too, but the blue of the flower is intense blue and shines through early evening and early morning best I have ever had. We’ve grown vipers bluegloss in out small town garden for several years now and would not be without it – it’s as beautiful as our delphiniums requiring no staking or moddy cuddling.